During excavation studies in the north of Switzerland, in Weiach and Leuggern conducted by researchers of the Zurich University Institute and Museum of Paleontology, fossilized pollen grains belonging to flowering plants have been discovered. Dating back 240 million years, these pollen grains prove that flowering plants, with all their flawless characteristics, existed millions of years ago. “… the present finding of flower-like pollen from the Triassic is significant,” says Prof. Peter Hochuli from the University of Zurich, while explaining this subject. 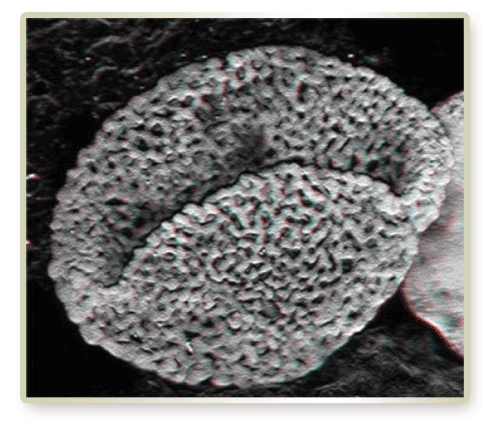 High-resolution 3D images of six different types of pollen have been obtained with Confocal Laser Scanning Microscopy. As can be seen from these images, the structure of the pollens demonstrates that the plants were pollinated by insects. Evolutionists claim that life forms evolve from simple forms to more advanced ones. The fact is, however, that plants that existed millions of years ago possessed flawless and irreducibly complex systems as well. These systems prove that living things are created by a sublime intelligence, and did not come into being simply by chance. Fossilized pollen grains dating back 240 million years are among the most important examples of this immaculate creation in plants. God has created the highly complex system of reproduction as reproduction by pollination in plants. Claiming that such a system came into being through blind coincidences is against science. Pollination is the name of the process by which pollen is transferred from the anther (male part) to the stigma (female part) of the plant. Pollen adhering to the pistil then descends through a tube to the ovules, resulting in fertilization. Pollens are carried to the pistil by insects, the wind or by water. This system created by God for the reproduction of plants existed in all its perfection 240 million years ago as well and this once again refutes evolutionists’ claims. God, the Omniscient and Almighty, created plants that lived millions of years ago and the insects that pollinated them. How Much Further Will Darwinists Have to Push Their Imaginary Evolutionar Process Back?